2 Bedroom Apartment - 7nights stay. Queen bed and 2 single beds. 100 metres to patrolled beach. 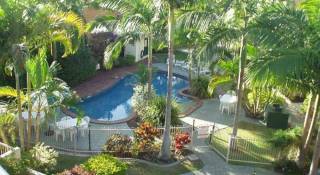 Burleigh Palms is a 3 story building in the centre of the Gold Coast at Burleigh Heads.With a heated salt water swimming pool, swimming is enjoyable all year round. Burleigh Palms is a great family holiday spot. It has a wonderful old fashioned atmosphere. 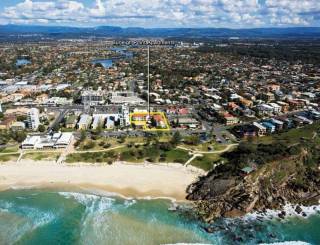 Although our building is only 100 metres from Beautiful Burleigh patrolled beach, we do not have any sea views. The rooms look out onto the pool and tropical gardens and barbeque pavilions. Ground floor units are wheel chair friendly (please request). There is no lift access. All our rooms are non smoking. We pride ourselves on being family friendly as well as being clean and comfortable. Burleigh Heads is a great family holiday spot. Close to everything and yet has an old fashioned village atmosphere. If you are looking for clean and comfortable accommodation in the heart of the Gold Coast, then Burleigh Palms is the place for you. 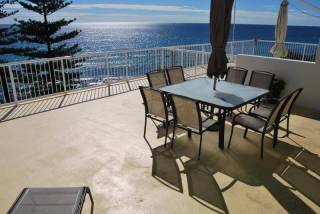 This complex is a 31/2 star property (self rated) and is situated 100 meters to beautiful Burleigh Beach and right next to the shopping center, hotels, clubs and restaurants. Burleigh Palms is a 3 story block (no lifts) with 28 fully self contained 1 and 2 bedroom units. We are situated on the Gold Coast Highway with bus stop right at the door. Pick up from Gold Coast or Brisbane Airport can be arranged and all tours can be booked from reception as well as theme park tickets and transfers available too. You can choose a relaxing short break or a non stop hi energy holiday. A deposit of $200 is required on booking ($300 for a Christmas booking) The balance of payment must be paid on arrival. If you have to cancel your booking and can do so 2 weeks prior to arrival, we will refund 80% of your deposit. However if the cancellation is within 2 weeks of arrival no refund can be made.